Pearl Motor Yachts to be present at Cannes Yachting Festival 2014 – Superyachts News, Luxury Yachts, Charter & Yachts for Sale. 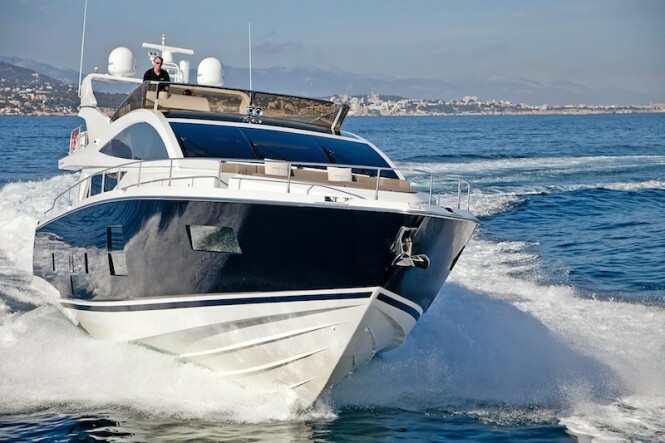 Both the Pearl 65 and Pearl 75 yachts feature pod-drive propulsion, incorporating joystick control technology offering the ability to operate the yacht without crew, if preferred. Standard features of the Pearl fleet also include a hydraulically operated bathing platform, air conditioning, hydraulic passerelle, generator, and teak decking. Iain Smallridge, managing director of Pearl Motor Yacht’s believes that the second in the series of yachts to be made in this special collaboration will make a real impact at this year’s Cannes Boat Show. “The launch of the Pearl 75 exceeded all of our expectations, we were overwhelmed by the response we received – thanks to the unique elements both Bill Dixon and Kelly Hoppen bring to the Pearl range, and their drive for pioneering design excellence. “This partnership has provided our customers with something that is totally unique – and has created a great deal of anticipation surrounding the launch of the Pearl 65. Powered by either triple Cummins Zeus 600hp, Twin Volvo IPS 800hp engines or twin Volvo D13 shaft drive, the yacht will have a fuel capacity of 770 Gallons (3,500 litres), reach a top speed of 32 knots and have a cruising range of 350 nautical miles.